Who doesn’t need a big, bulky hat for cold winter days? This is a very functional hat that is perfect for cold winters! The stitch pattern creates a checker board texture with seed stitch inside. It is made of bulky acrylic yarn, making it very warm and durable. This hat will last you for many seasons! The long brim allows this hat to be worn as a Slouch Beanie or Watch Cap, depending on your mood! The pattern is simple enough for knitters that are just beginning to knit in the round and a quick snow day project for an experienced knitter. 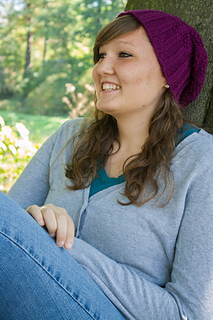 There are many different colorways of the yarn used, so this hat can be a part of anyone’s winter wardrobe. No matter the color of the beanie the knitter chooses to make, the garment will provide warmth and fold to fit easily in a coat pocket.